Long ago there was a very useful mod for Minecraft begginers that didn’t know about crafting, its name was Crafting Table 2 and Crafting Table 3. The updated mod stopped but now returns with some differences and under a new name. 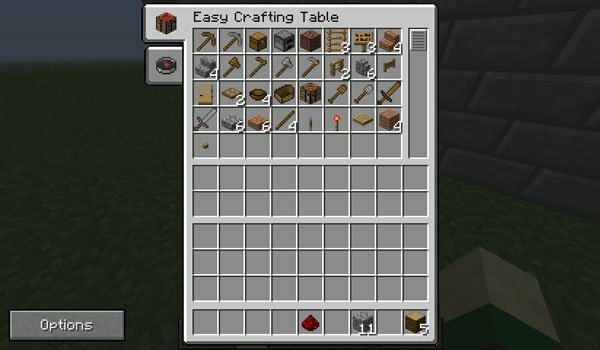 Crafting Easy 1.7.2 and 1.7.10 is a mod that adds a new crafting table that we can create with redstone, crafting table and a book. With it we can see all possible crafts that can be donw with our current materials. It also has extra space (red cells) where we can place those materials that do not want to show us their chances of crafting. How to install Easy Crafting Mod for Minecraft 1.7.2 and 1.7.10? Paste the downloaded mod file within .minecraft / mods folder. All crafting possibilities with a single click! Easy craftings for begginers!